Last night the company Emily works for held their Christmas party at Sydney Aquarium. 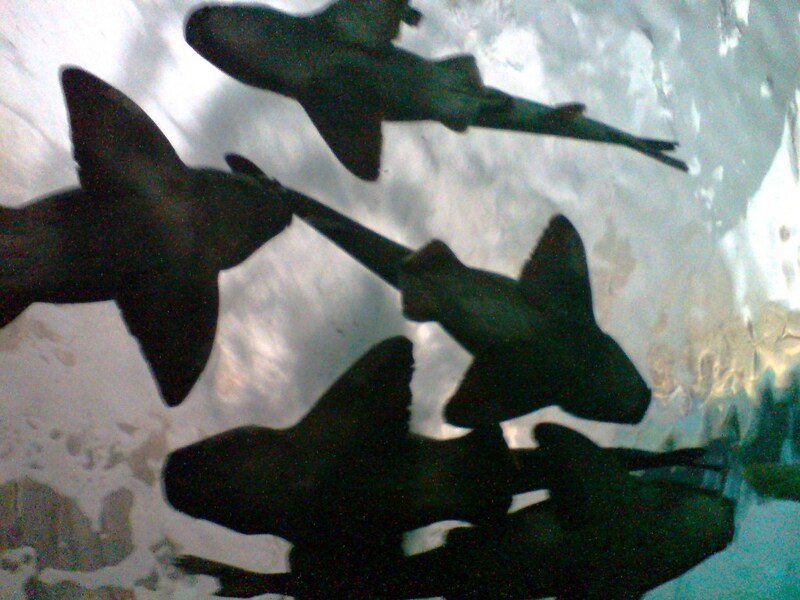 The aquarium is one of Sydney's top attractions, and deservedly so. It may cost $25 to get in but the sting of this wears off the instant you see the platypi (platypusses?) which are right inside the main entrance. I didn't have the presence of mind to take any video footage of them sadly, but I did take some from the oceanarium which you can see above. 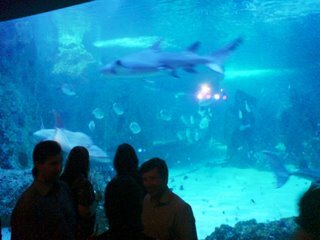 The party itself was held in a room that you get to only at the end of walking round the aquarium and before the gift shop which sells a wide variety of high-quality tat. One whole wall of the room is glass looking into the largest and most fully stocked larder tank in the place. The overall effect is a bit like a ten foot tall screensaver. It has a bizarre hypnotic effect that transfixes normally hyperactive ritalin candidate children into awed silence. Why they don't have a webcam focussed on this I can't imagine. They do have 2 rather boring webcams focussed on the crocodile and the fairy penguins (stop that thought, the penguins are rugged Aussie types). Quite a large number of the canapes served at the event seemed to be fish or fish based. I couldn't quite get the image of the waiters with a fishing net and waiting deep-fryer out of my mind.